Birth date and place 14 Nov 1831 Killyleagh, Newtownards, Down, Ireland. Physical Description Height: 5 ft. 7½ ins. Complexion: fresh. Eyes: grey. Hair: light. Marriage date and place 1st: 15 Apr 1857 Killinchy, Down, Ireland. 2nd: 17 Jun 1881 Northampton, Western Australia. Spouse 1st: Susannah QUINN (d. 1875). 2nd: Mary DALTON widow of Patrick Fahey. Children Isabella bp. 1857, Raffrey, Down, Ireland. Osborne bp. 1860, Raffrey, Down, Ireland. Agnes Susanah b. 1865, Geraldton, Western Australia. Matthew Francis b. 1868, Greenough, Western Australia. William John b. 1870, Victoria District, Western Australia. Alice May b. 1872 Greenough, Western Australia. Anne Jane b. 1874 (d.1874), Northampton, Western Australia. George b. 1875 (d.1875), Northampton, Western Australia. 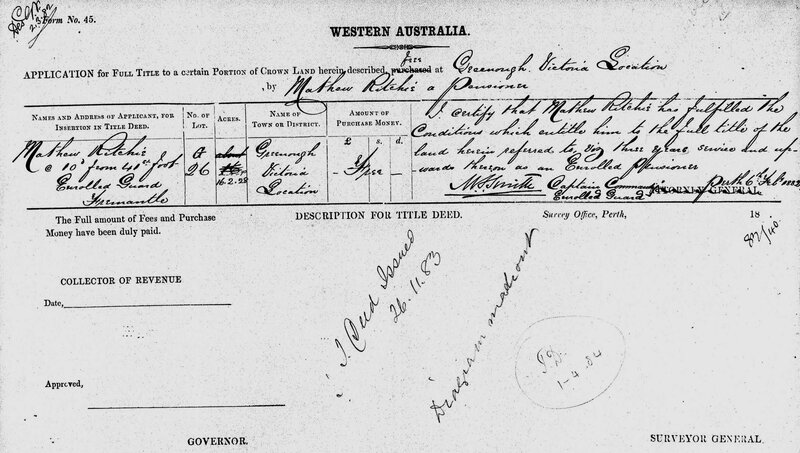 Death date and place 15 May 1892 Western Australia. 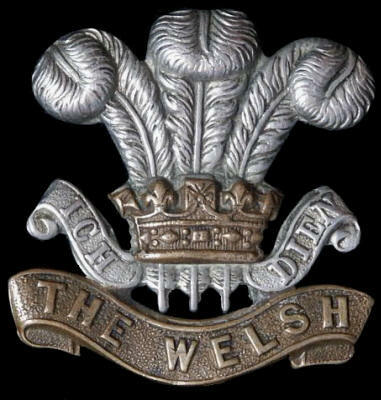 Regiment(s) 41st (The Welch) Regiment. Regiment No. and Rank #2829 Private. Attestation date and place 24 May 1849 Belfast, Down. Service/Campaigns Ionian Islands 1 year 11 months. Malta 1 year 1 month. Turkey & Crimea 2 years. Musters 1851 Cork, Ireland and at sea [WO12-5447]. Promotions & Reductions Private to Corporal 1 Apr 1854. Corporal to Private 1 Sep 1855. Casualty/Medical Casualty Roll: Severe Wound. Final Attack on the Redan. 08 September 1855. Unable to march or do the active duties of a soldier, in consequence of a bullet (musket) having (on Sep 8/55 in the final assault on Sebastopol) lodged in the Right Foot, entering to the outside of the Tendo Achillis about 2 inches above its attachment (insertion) and was taken out 2 months afterwards at the same place. He states that the bullet lodged at the anterior part of the instep, though it was taken out where it entered. In consequence, the R. heel is an inch off the ground and that knee joint is impaired in function. Unfit for further service [Chatham July 1/55]. Regimental Courts Martial Confined awaiting trial 30 Aug to 1 Sep 1855. Tried at Camp before Sevastopol 1 Sep 1855 for being drunk returning from Scutari sick. Sentenced Reduction to Private. 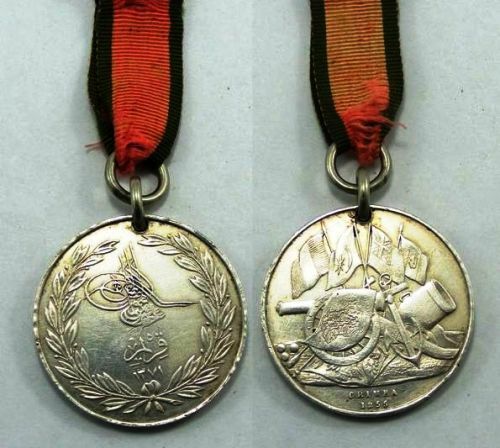 One Ring [Good Conduct Badge] with pay forfeited. Discharge date and place 29 Jul 1856 Chatham. Length of Service 6 years 246 days. Post Discharge Residence Not stated. Post Discharge Pension District Newry (1856). 2nd Belfast (1860). 1st Belfast (1861). Pension Amount 8d. per diem. Increased to 10d. per diem on 18 Jan 1881 for EPF service. Departure and Arrival 15 Mar 1863 Plymouth; 29 May 1863 Fremantle. Enrolled Guard 15 Dec 1881 to disbandment 31 Mar 1887. Land Grant/Purchase 27 Oct 1880 Greenough Flats, Victoria District, Location G25, 16 acres (grant). 26 Nov 1883 Greenough, Victoria District, Location G26, 16 acres (grant). Misc. Newspaper Articles West Australian Oct 1881 (four weeks) & Jul 1882 (five weeks) see sidebar. 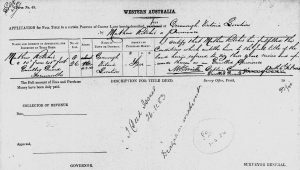 West Australian 31 Mar 1887 – unlicenced cart. Enquirer & Commercial News 6 Apr 1887.